Gray Cook is a practicing physical therapist, and orthopedic certified specialist. He is also a certified strength and conditioning specialist and kettlebell instructor. Cook is the founder of Functional Movement Systems and author of Athletic Body in Balance and Movement. His work promotes the concept of movement pattern screening and assessment. 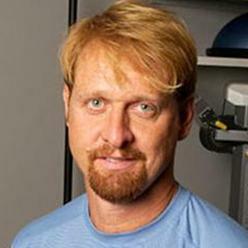 His ideas are at the forefront of fitness, conditioning, injury prevention and rehabilitation. Cook’s career began with an undergraduate degree in Sports Medicine and Exercise Science with minors in Athletic Training and Psychology. His interest took him to the University of Miami where he studied physical therapy and furthered his strength and conditioning development. It's no accident that he became a Certified Strength Coach and Licensed Physical Therapist in the same year because his work since has targeted fundamental errors in the way that exercise and rehabilitation have been practiced. Gray has introduced a systems approach to understanding, training and rehabilitating movement. Our current knowledge and scientific advances have not reversed the downward turn in the health and fitness of our culture. Fitness and rehabilitation are approaching a critical tipping point where fundamental systems are necessary for improved outcomes. Fundamental systems minimize logistical errors and improve communication between the many disciplines that exercise and rehabilitate the masses. Cook contends that we must map movement patterns and consider movement as a behavior and not simply as clean mechanical data. We must also develop better understanding of how movement is learned, maintained, and restored. Cook's work cuts to the core of problems like low back pain, obesity, and the general physical decline of a modern culture. By revisiting the natural developmental principals that all infants employ as they learn to walk, run and climb, Gray forces us to rethink motor learning, corrective exercise, and modern conditioning practices.